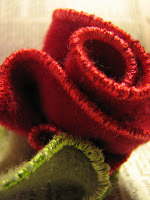 I love all kinds of felt, but my favorites are felted knits and felt made with recycled materials. 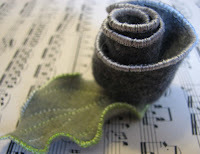 My newest felt projects are roses made with recycled felt. At this time of the year it's pretty easy to find 100% wool coats and sweaters at thrift shops. A tired winter coat is transformed into fun felt treasures. You start with a long strip of nice felt. Edge it with machine satin stitch (I do about 3 layers of stitching) in machine embroidery thread. Do the same thing for the leaf, then straight stitch veins on the leaf. Roll up the strip of felt starting with a wider end. Double it back upon itself and gather bits along the way. Hand sew it all together, sew on the leaf, and then end up by sewing on a pin on the back. Look for them in my Etsy shop. WOW! I feel like I've shopped for you all your life.Hey I'm older but we hit the same shops. Ciao, from your Scavenger Hunt Spoiler! These are really lovely! I must try them someday. I love making felted flowers, but mine are usually much less dimensional than your lovely roses. Thanks for the mini tutorial!